Jeremejevite was named for a Russian mineralogist in 1883, but there are rarely any specimens found in Russia today. Recently Namibia has started to produce some mentionable crystals, but in such small amounts the stone is still very rare. 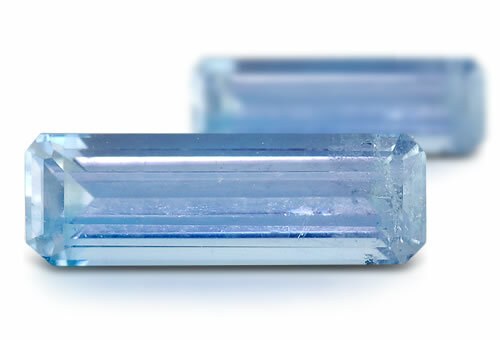 Jeremejevite is typically found in pale blue-green, cornflower-blue to yellowish brown hues. RI, birefringence and possible optic character. Jeremejevite is a composite mineral with a uniaxial hexagonal outer zone and a biaxial monoclinic core.Piezoelectric: development of opposite charges at the ends of the crystal when placed under stress. Jeremejevite often shows banding or growth related color zoning and occasionally step-like growth zoning that looks like lightning bolts. Stones can have natural inclusions, fingerprints and healing feathers.